FinLab Solutions SA announces the release of Packhedge™ V.5.3 providing major enhancements which include Consolidated Portfolios and a new Mail Robot. FinLab is pleased to announce the release of PackHedge™ v.5.3 which provides a multitude of new features and enhanced functions. The key elements of this release include the new Consolidated Portfolio component and the new Mail Robot. “Portfolio Managers need an easy and efficient way to consolidate any selection of their portfolios to monitor, analyse, report and manage overall positions and exposures, the new PackHedge™ Consolidated Portfolio now makes this a very simple process.” FinLab's CEO, Denis de Pentheny O’Kelly stated. Consolidated Portfolios allow users to very simply select, drag and drop the portfolios they want into the appropriate consolidated portfolio(s). Consolidated Portfolios provide an overall consolidated view and analysis of all aspects of the underlying portfolios across shareholder positions, asset allocations, transactions, balance sheet, P&L, cash flows, liquidity, performance, contributions, exposures, etc. In addition, portfolios and consolidated portfolios have been extended with new Net Cash Flow and Cash Flow Metric screens that show cash flows per period, per investment, per shareholder with contributions, distributions, positions, available cash and the remaining commitments for the Private Equity positions. The full range of PackHedge™’s extensive analytical and reporting functions can be used on consolidate portfolios, such as segmentation analysis, contribution analysis by return and various risk statistics, attribution analysis, stress testing, scenario analysis, sensitivity analysis, portfolio optimization, style analysis and peer group analysis, extensive risk analysis and statistics, PCA (principle component analysis), cluster analysis, etc. An integrated Mail Robot has been added to complement the PackHedge™ DMS (Document Management System) and can be configured to process incoming emails from any IMAP account(s) to extract emails, content and/or attachments. Trigger conditions can be set on any combination of criteria on the sender, subject or email content, etc. Multiple actions are available: add email and/or attached items to the DMS, add email content to PackHedge™ Notes and/or add email hyperlinks to PackHedge™ Document Linking. Custom matching logic is available to determine the object(s) to which to attach the emails/documents/data. The Mail Robot can be configured locally or at the server level on any IMAP accounts. A Wordpress interface is available to track changes on a Wordpress Website and to update the related field(s) in PackHedge™. FinLab Solutions SA is a software solutions company that develops, distributes and supports one of the world’s most advanced investment industry solutions for Alternative/Hedge funds, Private Equity funds, Mutual/Traditional funds and other investment instruments (UCITS, ETFs, Equities, Real Estate, Art Collections, etc.) empowering; quantitative and qualitative research and analysis, risk analysis, stress testing, scenario analysis, exposure analysis, contribution and attribution analysis, asset allocation, portfolio construction and management, shadow accounting for portfolios, managed accounts and funds of funds, due diligence, document management, workflow and financial innovation. The company’s solution PackHedge™, provides a series of state of the art modular software tools in a single fully integrated platform that provides: Unmatched portfolio construction and management tools for complete pro-forma portfolio simulation and/or comprehensive portfolio construction and management for mixed asset portfolios, managed accounts or funds of funds with liquidity ladder analysis, contribution analysis, attribution analysis and exposure analysis. PackHedge™ offers the most advanced analysis tools including: stress testing, scenario analysis, sensitivity analysis, portfolio optimization, style analysis and peer group analysis, extensive risk analysis and statistics, PCA (principle component analysis) and cluster analysis. Comprehensive CRM, Outlook synchronization, document management, Mail Robot, workflow management tools including setting limits and alarms. PackHedge™ is built on a unique and powerful multi-source, multi-currency, multi-frequency qualitative and quantitative data management model. PackHedge™ includes data aggregation, extensive statistical analysis and charting, a multi-dimensional query engine, and an extremely flexible, easy to use and powerful custom reporting and batch report production capabilities. In addition, tools to manage time series imports and customizable due diligence questionnaires are provided to ensure full data integrity. The company was founded in 1999 and is headquartered in Geneva, Switzerland, with offices in the United States and Singapore. FinLab Solutions SA, 35 Rue Rothschild, CH-1202 Geneva, Switzerland. Denis de Pentheny O’Kelly: +41-22-908-2700 or +1-302-468-6925 or ddepokelly@finlab.com. 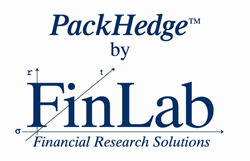 FinLab Solutions SA announces the release of PackHedge™ v.5.3.providing major enhancements which include Consolidated Portfolios and a new Mail Robot.